Read the feature article from Horse World Magazine here! Scottfield’s 2016 People’s Choice Award winners! Congratulations to DLM Farms, LLC, on the sale of Tallulah Up Town! 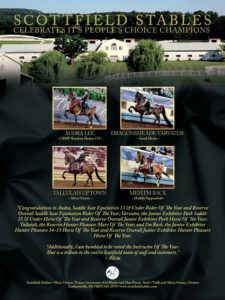 DLM Farms, LLC, congratulates Valeria Morgans, LLC, on their selection of Tallulah Up Town (Town Assets x Captured Moment). This gorgeous 7 year old mare has been meticulously prepared and is always a favorite in the Hunter division no matter where she shows! Tallulah has been at Scottfield before she knew how to tie, and in her career to date, she has been shown 24 times; she has been top two in more than half of those classes (which is no small feat– we all know how big these Hunter classes are and how varied judging can be in the Hunter division! ); she has never shown and not gotten a prize (in fact, you can count on one hand the number of times she hasn’t finished in the top 3!) 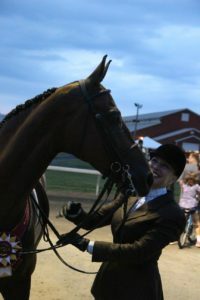 Tallulah has earned several regional wins, including being crowned the 2016 New England Regional Open Hunter Mare and East Coast Open Hunter Pleasure Reserve Grand Champion. She also has wins with a Junior Exhibitor in the irons. Expressive and truly beautiful, this mare is a top Hunter, regardless of the show, competition, division or judge, and we ca n’t wait to see her continue her winning ways with new owner, Charlene Burger, in the irons! Special thanks to DLM Farm for letting us campaign Tallulah and for trusting us to find her a great show home! Congratulations to the Triple A Partners on the sale of Arethusa! 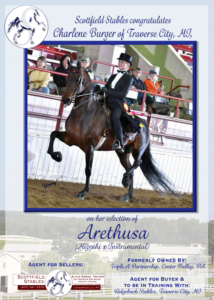 The Triple A Partners congratulate Charlene Burger of Traverse City Michigan on her selection of Arethusa! 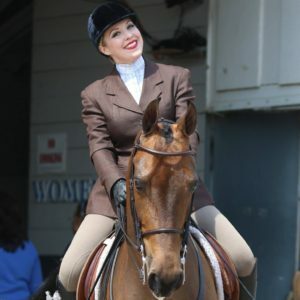 Though “Rockette” has been shown to date in the English Pleasure and Park Saddle divisions, this beautifully bred, bold moving mare will be moving into the hunter division under the guidance of new trainer, Tristy Redmond at Ridgeback Farm. Special thanks to the Triple A Partners for allowing Scottfield to represent you as the selling agent for Arethusa!